I always had ambitions to paint in high mountains. Snowdonia and Ben Nevis didn't tax me too much, and while the Rockies and the Andes were both beautiful, they were hardly adventures, since we travelled mostly by car. 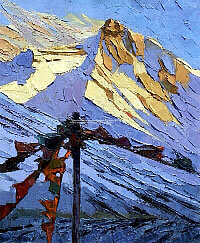 My long-held dream to paint Mount Everest always seemed an impossible one. However, back in 2010, my good friend, the explorer David Hempleman-Adams, emailed me out of the blue: As you can imagine, I have another expedition up my sleeve. I am planning to take a group of climbers and trekkers to Everest in April. I'm contacting you to see if you would like to join us as the expedition artist... So for the next six months I trained with my son Robin and we set about getting all the kit, travel documents and vaccinations necessary for this great adventure. Robin and I landed in Kathmandu in the early hours of yesterday morning. My first impressions were dominated by traffic chaos and a cacophony of car horns. The golden Buddhist temples in Durbar Square are simply magnificent. We travelled the precarious road to base camp with our Sherpa guide - it is a notoriously dangerous route, with cliffs dropping away hundreds of feet to the valleys below. Every time our Land Rover swerves to make way for the enormous trucks that come hurtling towards us, my heart leaps. 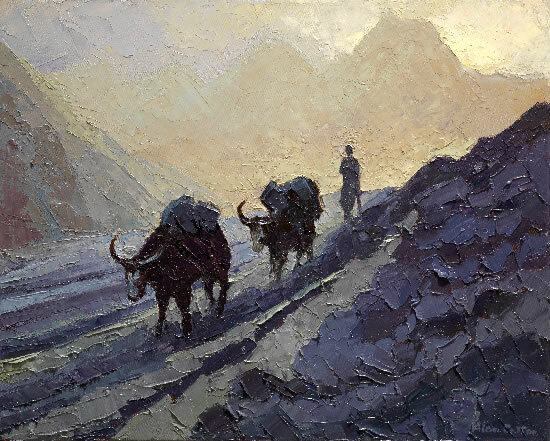 Tibet - Yak Trail in the Himalayas, oil on canvas, 41x51cm. I'm sure there's a painting in that"
The drive towards the Chinese-Tibetan border is frightening, even in bright sunlight - today there is a 'deep mist and although we can no longer see the sheer drop falling away on the edge of the road, we know it is there. We pull in to a hotel cut into the mountainside: by far the worst accommodation I have ever experienced. There's no running water and no loo but we are high up in the Himalayas, so what did we expect? A herd of yaks emerged from the mist, lumbering down the track beside the hotel. I managed to do a quick sketch before they disappeared into the gloom. I`m sure there's a painting in that- a nice contrast to the ones I will be doing from Everest Base Camp. Today we drove to Tingri, our last stop before the Rongbuk Monastery. We did a relatively steep climb and got our first glimpse of Everest among the peaks of the Himalayan range. We're off to bed, elated by the thought that by tomorrow evening we will be at base camp. We're stunned by what has happened during the night, that I hardly know where to start with today's journal. We went to bed last night so excited at the thought of travelling on to Rongbuk Monastery at 17,000ft, then trekking to the first expedition base camp. At 1am, we awoke to a hammering on the door. Robin leapt out of bed as nine police officers burst into our room. They emptied all our bags and searched every item - even flicking through packets of tissues and examining the hems of garments. They took our cameras and looked at every image. 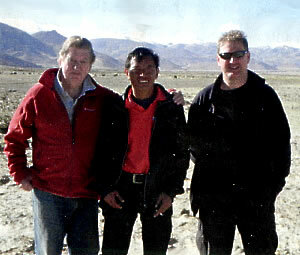 Alan (left) and Robin (right) with their Sherpa guide. We could hear the same investigation being carried out in the room next door, where one member of our small party of four, an American, was being quite confrontational and was treated even more aggressively than we were. We tried to ask what was happening and what they were looking for but were told "No questions". All this time, they were videoing and photographing us. They finally left, telling us we were not to leave the hotel complex. Later that day, we discovered that a group of American students had staged a protest at the Rongbuk Monastery on the previous evening to mark the 60th anniversary of the Chinese invasion of Tibet. As our party included an American, I guess we were suspects. The most devastating news for me is that, as a result of the protest, the Chinese authorities have now closed the route to base camp for an indefinite period. Our guide says we have to leave Tibet the following day and make our way back to Kathmandu. We are utterly bewildered and stunned by the events of the past 24 hours. The frustration of getting so close is hard to bear. David and his team of climbers had gone out a month ahead of us and will now complete the climb without us. Just checked in our bags here at the airport. Suddenly the reality of our aborted trip has sunk in. I guess until now I held the faint hope that someone would say, "It's okay you can go back", but no: in an hour we'll be flying home. David and three of his team today reached the summit of Everest by the North Col. Thrilled for them but even more saddened now that I'm not out there to celebrate. Just had a phone call from David, back from Everest. Knowing I was devastated not to make it to base camp, he suggests we return, just the two of us. "This is unfinished business," he told me. Suddenly my spirits are soaring. Arrived in Kathmandu late last night and today we are already on our way towards the border with Tibet. No time for sightseeing. Need to stay at Shigatse over night to acclimatise but I just want to keep on going. We should have spent two days at Shigatse acclimatising but I persuaded David to travel to Tingri today. We are now at the point where last time we were turned back. I shall go nervously to bed tonight - fearful of another raid. I'm pleased to say it was an uneventful night. It's very cold - 10 degrees below zero - but the sun is up and the light is just amazing. We set off to the Rongbuk Monastery, our final stop before trekking to Base Camp. The monastery is the highest ecclesiastical building in the world. The courtyard at the entrance is bustling with people: many locals sewing, weaving or just chatting and a few weary travellers. I am sitting beside a spire-topped 'chorten' and looking towards Everest bathed in evening sunlight. Chortens are found all over Tibet - they are mounds of stone that originally housed the relics of the Buddha. They are a religious focal point in the landscape and believed to have a positive effect on the people who live nearby. I have already done several drawings and made numerous colour notes of the area. Set against a clear blue sky, the summit of Everest is golden - however fantastic I imagined it to be, it is so much more. It's too late to go on to base camp tonight but I shall be up at dawn and ready for that final trek. Everest is such a well-known image, that I knew I had to get it right"
I've made it. What a fantastic day. We trekked five miles to base camp. David made the decision that as there is no expedition based up there at the moment and no facilities and supplies, we should not camp up there. Instead, he suggests that we trek up and back in a day. We left at first light this morning and I don't have enough superlatives to recreate the emotions and exhilaration I felt at being so close to the highest mountain in the world. The only sad note is that my son Robin couldn't be with us on our return trip. I drew frantically to capture every detail of the mountain - it is such a well-known image that I knew I had to get it right. Although the mountain was in sunlight, temperatures rapidly dropped to -20°C. Even with silk gloves under my woollen ones, my fingers were numb as I sketched furiously before the sun finally disappeared. I was fascinated by the prayer flags placed there by the Buddhist climbers; colourful panels of cloth, containing texts and prayers. The Tibetans believe that these will be blown by the wind towards Mount Qomolangma (the ancient Tibetan name for Everest) to spread good will and compassion into all pervading space. The sky was a deep clear blue and, with the sun low on the horizon, the glistening slopes were bathed in golden light, with the ridges casting deep blue shadows into the valleys. Chilled to the bone, I was finally persuaded by an amazingly patient David to make our way down. I packed away my Sketchbook, filled with the drawings that would form the basis of many paintings back in my Devon studio. My time at the base of Qomolangma has come to an end and tomorrow we make our 12-hour, hair-raising journey back down to Nepal. This has been the toughest adventure I've had in my life but by far the most exhilarating. I was way out of my comfort zone and drawing at such cold temperatures was often painful, but it is when I have a new experience such as this that my best work comes. I have just completed my 20th painting of Everest and the Himalayan Range, for my forthcoming exhibition in London. "Where next?" asked my dealer, David Messum. Well, that's a thought - how do you top Everest? 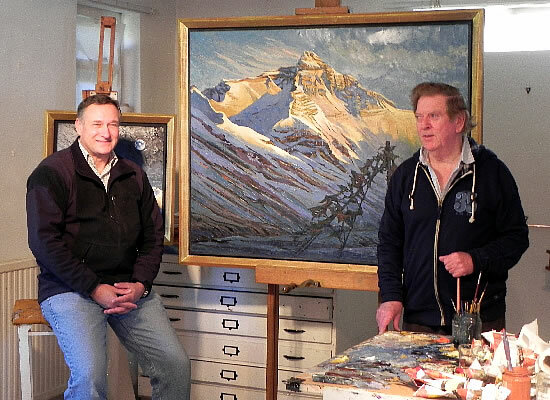 Alan gifts his first Everest painting to David Hempleman-Adams. 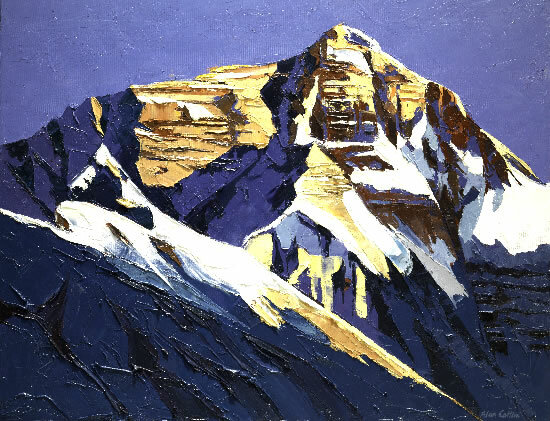 'Alan Cotton - Everest' runs from 12-29 September at Messum's, London W1.